Fourteen people killed in an aircraft that can only carry 10 has the stench of carelessness all over it. Most PC-12s can safely hold only six to nine passengers and one or two pilots. Why were there so many aboard and where were they seated? These youngsters and adults were going skiing. Where was the baggage and where was it stowed? How much did it weigh? Why did the aircraft divert? What were the qualifications and experience of the pilot? Was there a second pilot aboard? These preliminary answers are needed to explain why this aircraft fell out of the sky nose down before several eyewitnesses. Did it aerodynamically stall because it got too slow on final approach? Did it accumulate ice when flying at altitude and suffer a tail stall when the final flaps were selected? The weather at the accident site looked good but there was an area of significant icing en route. Did the engine quit as it has a number of other times in PC-12s, dooming the aircraft to a crash short of the airport? My calculations show that to stay within the gross weight limits, the pilot could only have put about 160 gallons of fuel aboard, less than what is required for a two and one-half hour flight plus reserves. The payload of a PC-12 is about 3,900 pounds. Seven adults weigh a minimum of 1,300 pounds. Seven children weigh about 500 pounds minimum. Baggage is figured at about 1,000 pounds total which includes skis, boots, poles, clothes, etc. Together, that comes to 2,800 pounds, leaving about 1,100 pounds available for fuel or about 160 gallons. The flight plan was for two and one-half hours en route which, together with required reserves, would have left very little useable fuel at the time of arrival and would have explained the diversion to a closer airport. Essentially the National Transportation Safety Board needs to look at whether the fuel was managed properly, or whether the engine quit on a short final approach with the fire coming from unusable fuel that misted or perhaps there was more unusable fuel than certified. Other questions must also be answered. Some of the equipment on board may have had a nonvolatile memory chip that could be helpful but the fire and impact may have destroyed that forever. The PC-12 like so many other turboprops has deicing boots that inflate to remove accumulated ice. These boots have proved inadequate in many other turboprops and if runback ice accumulated on the tail or on the wings at altitude and could not be shed, the extension of flaps might have shifted the center of lift aft and caused a tail stall which would have pitched the nose down sharply as described by witnesses. Coming on the heels of Continental flight 3407 at Buffalo for similar reasons, it is long overdue that turboprops be prohibited from flying in icing conditions until they all are retrofitted with anti-ice instead of deice equipment. That way ice is not permitted to accumulate at all on aircraft that have proved time and time again their inability to fly in icing conditions safely. This crash like most will be found to have been preventable and unnecessary. How horrible for these parents and their families! 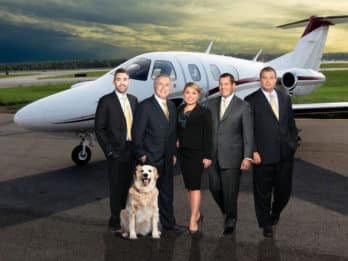 For more than 40 years, The Wolk Law Firm has concentrated its practice in the area of aviation law, with Arthur personally generating verdicts and settlements of nearly $1 billion during the last decade alone. He is known for obtaining and on appeal, holding, the largest verdicts for each type of air accident claim in recent aviation history. Do Southwest and American already have the Software Fix for the MAX 8? IS IT TIME TO GROUND THE BOEING 737 MAX? Sikkelee v. Precision Airmotive Corp., et al. WHEN IT COMES TO AVIATION SAFETY, WHO IS REALLY TO BLAME? The Boeing 737: How safe are these planes? We get results. From the largest aviation verdict of all time, $480,000,000, to many other recoveries measured in the tens of millions, there isn’t any peer for The Wolk Law Firm. What makes The Wolk Law Firm unique is commitment to their clients – they handle nothing but air crash cases for plaintiffs. Copyright ©2019 The Wolk Law Firm. All Rights Reserved.